Many people have a fear that the dead watch us. They believe that these spirits of those that have lived look at us with their invisible eyes. They scrutinize our decisions and make folly of our mistakes and embarrassments. Mostly real ghosts do not interfere in the lives of the living. Well lets just say that they just observe us and make rude comments. As I always state I don't care what the dead think or what the living have to say. I know I believe in what I personally have experienced as witnessed in my life as the testament to what I know is real to me. From my personal experiences many ghosts do make predictions about the future. I often record them and post them on my site http://ghosthuntersofamerica.com/. As noted by myself and many others some predictions or very uncanny. Many ghost just watch the living. And it seems that all they do. They watch us eat, sleep and do the things we'd be ashamed to speak of in public. It seems that real ghost do know our many secrets and can by some strange qualities assigned to them effect us and possibly our lives. Of course that is also beyond the five tangible senses. Many spirits during Necromantic rituals when they appear often speak of times to come when questioned. Some believe that ghosts and otherworldly beings can step through the fabric of time and space and bring news of the unseen things to come. All the predictions you will read posted here have come to me from actual real spirits or ghost I have contacted through Necromancy. I am not a psychic nor do I make predictions of future events. I only post these things that the spirits tell me as a early warning of impending disasters or things people should be aware of. Many times individuals will write me and tell me the tales of long dead lovers and friends watching over them. In some cases actually saving them from tragedies or helping them to make the right choices. Be it just the comfort of letting themselves believe that a ghost, spirit or otherworldly being has taken interest in a mundane occurrence can actually be comforting to some. There or those that wish Momma could see them now, or hope a dead person is happy at seeing how they have coped with their untimely passing. But who is to say that this just might be a fools desperate wish. Those that we have known, or that have known us when they were alive might often just look at us from beyond the veil that separates the living from the dead. But we must question this to try to understand why? Is it sentiment of caring? Might it be just to catch up on old times? Nostalgic feelings or often the reasons many think the dead watch them. Well you can liken it to like a sort of like looking at your old high school yearbook and wondering what happened to that old friend of mine. If we assign human feelings and caring to the dead as we have in life then we can make sense out of this and explain it it away as them grieving for us as we do them. The living being that we are, in general often assigns human qualities to everything from pets to inanimate objects that surround us. It does not mean they feel or believe as we do it is just assumed that this is so. When a loved one passes on we often hope that instead of the dead going to their just rewards and forgetting the life they led. We in away hope that they feel the loss of us as we do them. We want to believe that the soul lives in. And that this consciousness that was our dearly departed still urns to touch us and be with us as we would them. And that of course is if death is not the final curtain. According to traditional belief, a ghost is the soul or spirit of a deceased person, taken to be capable of appearing in visible form or otherwise manifesting itself to the living. Descriptions of the apparition of ghosts vary widely: the mode of manifestation can range from an invisible presence to translucent or wispy shapes, to realistic, life-like visions. The deliberate attempt to contact the spirit of a deceased person is known as necromancy, or in spiritism as a séance. The belief in manifestations of the spirits of the dead is widespread, dating back to animism or ancestor worship in pre-literate cultures. Certain religious practices—funeral rites, exorcisms, and some practices of spiritualism and ritual magic—are specifically designed to appease the spirits of the dead. Ghosts are generally described as solitary essences that haunt particular locations, objects, or people with which they were associated in life, though stories of phantom armies, ghost trains, phantom ships, and even ghost animals have also been recounted. As an example take the supposed fictional real vampire of today. They are often thought of as the perfect dead creature. It rises from the grave each night searching for blood of the living to survive. It is endowed with great powers over life and death and almost magical in it's abilities to effect the living. But alas a Vampire is still considered dead. Once by custom a person who actually dies and becomes a vampire was by all practical traditions thought the person was to loose the qualities of being alive. Mainly forgetting about what a person means to them and their only lust is to take blood to survive. Bram Stoker changed all that with his invention of the Dark count from Transylvania. Before this book the Vampire was only a dead monster that prowled the night feeding on the living. Void of any human compassion it's only desire being it's blood lust. The novel Dracula is mainly composed of journal entries and letters written by several narrators who also serve as the novel's main protagonists; Bram Stoker supplemented the story with occasional newspaper clippings to relate events not directly witnessed by the story's characters. The tale begins with Jonathan Harker, a newly qualified English solicitor, journeying by train and carriage from England to Count Dracula's crumbling, remote castle (situated in the Carpathian Mountains on the border of Transylvania, Bukovina and Moldavia). The purpose of his mission is to provide legal support to Dracula for a real estate transaction overseen by Harker's employer, Peter Hawkins, of Exeter in England. At first enticed by Dracula's gracious manner, Harker soon discovers that he has become a prisoner in the castle. He also begins to see disquieting facets of Dracula's nocturnal life. One night while searching for a way out of the castle, and against Dracula's strict admonition not to venture outside his room at night, Harker falls under the spell of three wanton female vampires, the Brides of Dracula. He is saved at the last second by the Count, because he wants to keep Harker alive just long enough to obtain needed legal advice and teachings about England and London (Dracula's planned travel destination was to be among the "teeming millions"). Harker barely escapes from the castle with his life. Not long afterward, a Russian ship, the Demeter, having weighed anchor at Varna, runs aground on the shores of Whitby, England, during a fierce tempest. All of the crew are missing and presumed dead, and only one body is found, that of the captain tied to the ship's helm. The captain's log is recovered and tells of strange events that had taken place during the ship's journey. These events led to the gradual disappearance of the entire crew apparently owing to a malevolent presence on board the ill-fated ship. An animal described as a large dog is seen on the ship leaping ashore. The ship's cargo is described as silver sand and boxes of "mould", or earth, from Transylvania. Soon Dracula is tracking Harker's devoted fiancée, Wilhelmina "Mina" Murray, and her friend, Lucy Westenra. Lucy receives three marriage proposals in one day, from Dr. John Seward; Quincey Morris; and the Hon. Arthur Holmwood (later Lord Godalming). Lucy accepts Holmwood's proposal while turning down Seward and Morris, but all remain friends. There is a notable encounter between Dracula and Seward's patient Renfield, an insane man who means to consume insects, spiders, birds, and other creatures — in ascending order of size — in order to absorb their "life force". Renfield acts as a motion sensor, detecting Dracula's proximity and supplying clues accordingly. Lucy begins to waste away suspiciously. All her suitors fret, and Seward calls in his old teacher, Professor Abraham Van Helsing from Amsterdam. Van Helsing immediately determines the cause of Lucy's condition but refuses to disclose it, knowing that Seward's faith in him will be shaken if he starts to speak of vampires. Van Helsing tries multiple blood transfusions, but they are clearly losing ground. On a night when Van Helsing must return to Amsterdam (and his message to Seward asking him to watch the Westenra household is accidentally sent to the wrong address), Lucy and her mother are attacked by a wolf. Mrs Westenra, who has a heart condition, dies of fright, and Lucy apparently dies soon after. Lucy is buried, but soon afterward the newspapers report children being stalked in the night by a "bloofer lady" (as they describe it), i.e. "beautiful lady". Van Helsing, knowing that this means Lucy has become a vampire, confides in Seward, Lord Godalming and Morris. The suitors and Van Helsing track her down, and after a disturbing confrontation between her vampiric self and Arthur, they stake her heart, behead her, and fill her mouth with garlic. Around the same time, Jonathan Harker arrives home from recuperation in Budapest (where Mina joined and married him after his escape from the castle); he and Mina also join the coalition, who turn their attentions to dealing with Dracula. After Dracula learns of Van Helsing and the others' plot against him, he takes revenge by visiting—and biting— Mina at least three times. Dracula also feeds Mina his blood, creating a spiritual bond between them to control her. The only way to forestall this is to kill Dracula first. Mina slowly succumbs to the blood of the vampire that flows through her veins, switching back and forth from a state of consciousness to a state of semi-trance during which she is telepathically connected with Dracula. It is this connection that they start to use to deduce Dracula's movements. It is only possible to detect Dracula's surroundings when Mina is put under hypnosis by Van Helsing. This ability gradually gets weaker as the group makes their way to Dracula's castle. Dracula flees back to his castle in Transylvania, followed by Van Helsing's group, who manage to track him down just before sundown and destroy him by shearing "through the throat" with a knife and stabbing him in the heart also with a knife. Dracula crumbles to dust, his spell is lifted and Mina is freed from the marks. Quincey Morris is killed in the final battle, stabbed by Gypsies who had been charged with returning Dracula to his castle; the survivors return to England. But through fictional accounts the only quality that can sway a vampire or bring it's animation to an end is usually by the fact that he or it falls in love. Oh and of course at the hands of others, or even the person the dead thing falls in love-lust with. And more so such as the movies of recent years they have been giving the new quality of being human to creatures that are said to be soulless. To have a soul might liken one to having human feelings. To care love and cry at heartache and to feel what another's feels and respond by giving that individual what they need to move on from the sorrow and pains that hurt them. And that quality is to feel and seek the comfort of knowing someone that is still alive loves them. If the undead can love the living they why can't the truly dead do the same. Romantic ghost stories always often end in tragedy or redemption. For instance the classic "The Ghost And Mrs. Muir". Starring Rex Harrison, Gene Tierney, and Bernard Herrmann's musical score. In early 1900s England, Lucy Muir (Gene Tierney), a young widow, moves to the seaside and into Gull Cottage with her daughter Anna (Natalie Wood) and her maid Martha (Edna Best). She rents the house despite rumors the house is haunted, but she is visited by the ghostly apparition of the former owner, a roguish sea captain named Daniel Gregg (Rex Harrison), who promises to make himself known only to her; Anna is too young for ghosts. When Lucy's source of investment income dries up, he dictates to her his memoirs, entitled Blood and Swash. His racy recollections make the book a bestseller, allowing Lucy to stay in the house. During the course of writing the book, they fall in love, but as both realize it is a hopeless situation, Daniel tells her she should find a real (live) man. When she visits the publisher, she becomes attracted to suave Miles Fairley (George Sanders), a writer of children's stories known as "Uncle Neddy" who helps her obtain an interview. Captain Gregg, initially jealous of their relationship, decides finally to disappear and cease being an obstacle to her happiness. He ends their friendship and convinces her that he was all a dream whilst she sleeps. When a living person feels that the dead or looking at them in most cases fear only arises is of course when they do not know who the deceased person is who is looking at them. And most people fear encounters with stranger. Especially if they do not know the strangers intentions by their actions. Many believe the dead will do all sorts of things to catch our attention. This can range of course from from whispers on EVP's to real ghost photos, video's and supposed actual physical or sexual encounters with unseen entities. As we know ghosts, poltergeist, spirits, demons and all paranormal or supernatural manifestations have been reported in many cultures. Too often these ghosts can be destructive as well as vengeful also some are likened to practical jokers in their actions. They don't exist and the evidence claimed by believers is all in the mind. True or not people will believe what they feel is happening to them at time other worldly as others might view them as being a person with an over active imagination or mental illness. A haunted person also questions the facts to the state of their own sanity when paranormal occurrences start happening to them on a daily or regular basis. To the lucky people who don't have it happen to them they will often debunk the situation directly. Although the human soul was sometimes symbolically or literally depicted in ancient cultures as a bird or other animal, it was widely held that the soul was an exact reproduction of the body in every feature, even down to clothing the person wore. This is depicted in artwork from various ancient cultures, including such works as the Egyptian Book of the Dead, which shows deceased people in the afterlife appearing much as they did before death, including the style of dress. So then it is also believed that the qualities of how and what a person is attached to in life so is it still held in high regard after death. Another widespread belief misconception or conception concerning ghosts is that they were composed of a sort of transparent smoke or misty, airy, or subtle invisible material. Anthropologists speculate that this may also stem from early beliefs that ghosts were the person within the person (the person's spirit), most noticeable in ancient cultures as a person's breath, which upon exhaling in colder climates appears visibly as a white mist. This belief may have also fostered the metaphorical meaning of "breath" in certain languages, such as the Latin spiritus and the Greek pneuma, which by analogy became extended to mean the soul. In the Bible, God is depicted as animating Adam with a breath. In many traditional accounts, ghosts were often thought to be deceased people looking for vengeance, or imprisoned on earth for bad things they did during life. The appearance of a ghost has often been regarded as an omen or portent of death. Seeing one's own ghostly double or "fetch" is a related omen of death. White ladies were reported to appear in many rural areas, and supposed to have died tragically or suffered trauma in life. White Lady legends are found around the world. Common to many of them is the theme of losing or being betrayed by a husband or fiancé. They are often associated with an individual family line, as a harbinger of death. When one of these ghosts is seen it indicates that someone in the family is going to die, similar to a banshee. La Llorona , or approximately "lah yoh-ROH-nah", Spanish for "the crying woman"), sometimes called the Woman in White or the Weeping Woman is a figure in Hispanic folklore, the ghost of a woman crying for her dead children that she drowned. Her appearances are sometimes held to presage death and frequently are claimed to occur near bodies of water, particularly streams and rivers. There is much variation in tales of La Llorona, which are popular in Mexico and the United States (especially in Mexican American communities), and to an extent the rest of the Americas. The White Lady of Balete Drive, in Quezon City, is a ghost who appears as a long-haired woman in a white dress. According to legend, she was raped and killed by Japanese soldiers during the Japanese occupation of the Philippines in World War II. Most of the stories that have come out about her were told by taxi drivers doing the graveyard shift. In other instances it is said that when solitary people drive by Balete Drive in the wee hours of the morning, they tend to see the face of a woman in white in the rear view mirror for a split second before the apparition disappears. Some accidents on this road are blamed on the White Lady. Also please see: Marshall, Texas: The Ghost Crying White Lady, And The Real "Woman in White"
LISA LEE HARP WAUGH Is a necromancer in the 21st century. She is by what may call a real conduit to the world of the dead. She dressers in ceremonial robes, draws magical circles on the floor and commands spirits from Heaven, Hell and all places in between to appear before her and communicate with the living. As a teenager she studied heavily The Black Arts by Richard Cavendish and The Grand Grimoire by A.E Waite, the Malleus Maleficarum and anything she could get her hands on by the great by Eliphas Levi, John Dee and the great beast, Aleister Crowley. 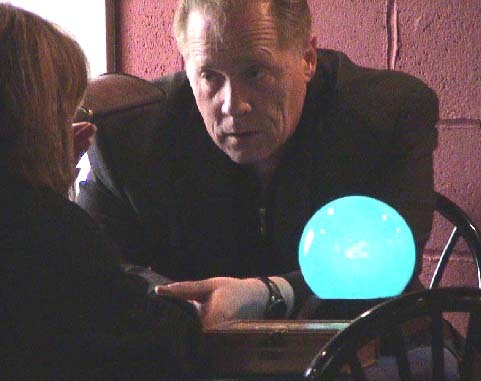 Waugh is what many have defined as the Most international traveling ghost hunter Necromancer to date. TOP TEN HAUNTED WEB SITES YOU NEED TO VISIT! Cryptids Real Cryptozoology: Even More Evidence Is Still Out There! Including "Cryptozoology". HAUNTED: HAUNTED. ~ HAUNTED? ~ HAUNTED! REAL GHOST PHOTOS OF THE "PARANORMAL LANDSCAPE" 'Real Ghost Photos' Can Or Will They Ever Be Really Fully Explained? ZOMBIE ROAD WHERE THE LIVING FEAR TO WALK! If you believe in Real Ghosts, Bigfoot, Chupacabras, Mothman, Sea Monsters, Aliens and UFO's... You need to read this Today! HauntedAmericaTours.com - Information on Ghost Box or Franks Box, Hacks and tricks to make your own!